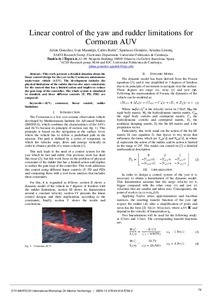 This work presents a detailed situation about the linear control design for the yaw in the Cormoran autonomous underwater vehicle (AUV). The development includes the physical limitations of the rudder that involve more constraints for the control that has a limited action and implies to reduce the gain loop of the controller. The whole system is simulated in simulink and three different controls (P, PD, PID) are compared. González, J. [et al.]. Linear control of the yaw and rudder limitations for Cormoran AUV. A: International Workshop on Marine Technology. "FIFTH INTERNATIONAL WORKSHOP ON MARINE TECHNOLOGY". Girona: 2013.